Human beings share the earth with many other living creatures and have dealt with them in many different ways. Animals have furnished humans with food, done their work, aroused their curiosity, provided them with "sport," stimulated their sense of beauty, and provoked their wonder. They have also shared affection, when both the human and animal have decided to give it. No less varied or avoidable are the attitudes humans have developed toward these creatures. This collection of writings selected from a vast literature about animals is also about the people who have been inspired to write on that subject. Sometimes consciously and sometimes unconsciously the writer implies an answer to one or more of the questions that any concern with an animal must raise, such as: What is an animal's place in nature? Are they here primarily to serve as a food source? Do they possess inherent rights and privileges? How are they alike or different from humans? The answers to these questions are as varied as the authors. Each narrative description, or exposition contributes something to an over-all picture of human beings' relations with and attitudes toward the animal kingdom. 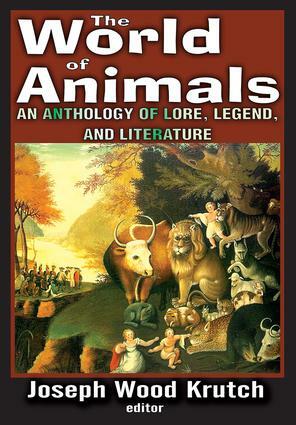 It is a remarkable conclusion, illustrated by Krutch's chronological arrangement within categories, that almost every major attitude and activity that has ever existed concerning animals still exists today even though there has been a drift in certain directions. Although the editor fairly represents the opposing view, his sympathies lie with those for whom the animal world embodies something to be loved and learned from rather than merely to be studied or exploited. From Aristotle to Darwin To?